Beef and vegetables at Han Dynasty in Old City. When it comes to Chinese food, Philadelphia is home to the best spot in Pennsylvania, according to a new list of the top honors around the United States. Even with a thriving Chinatown, The Daily Meal gave its distinction to Old City's Han Dynasty, a restaurant made magical by its wacky owner, Han Chiang. 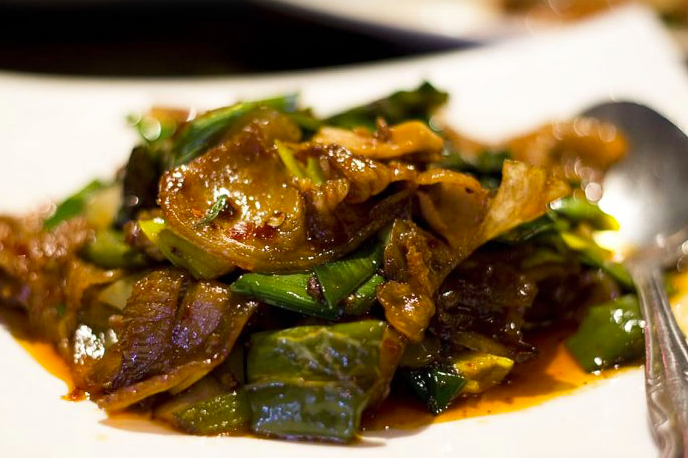 "The best Chinese restaurants in every state make an attempt to include authentic regional Chinese cuisine on their menus and aren’t afraid to think outside the standard, Chinese-American box," The Daily Meal said of its top picks. "They also use fresh ingredients whenever possible and turn out every dish with care and attention to detail." Chiang was thrilled to learn of the recognition. "It's an honor...and...yeah..." Chiang said. "I should be number one." There's no question Chiang's personality is an important part of Han Dynasty's success. The man doesn't even consider himself a chef. That's probably his modesty talking. Chiang recently announced the launch of a charitable new "Kung Fu Cooking Club" — think lessons in the kitchen and Kung Fu movies — whose first session was booked solid in a matter of a day or so. He's kind of the Joel Embiid of Chinese restaurants. "If you are stressed, it's very very bad for u," Chiang posted last week on Facebook to announce his club. "U gonna f---ing die early!!! !😤😡☠️ Let it go and focus on some positive s----!!!" There's also the classic limited time Mandarin Trump special he offered last summer, complete with a morbidly awesome illustration of the President-elect as a chicken, running for dear life from Chiang as he wields a meat cleaver. Han Dynasty is open seven days a week at 123 Chestnut Street, and yes, they do deliver.